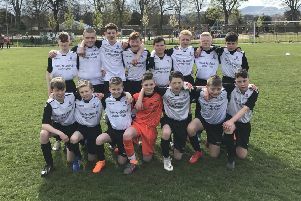 A penalty from Owen Gray was enough to see Leith Athletic A Team 13s into the South East Region Cup final as they held off Musselburgh Windsor 13s 1-0 at Pinkie Playing Fields. In what was a tightly contested cup tie, both sides looked well up for the fight from the kick-off. After a stubborn midfield battle to begin with, Athletic began creating chances as the wind and rain battered down. Euan Howie showed pace and trickery down the left flank for Leith before cutting into the box, but his shot hit the side-netting. Then, in the tenth minute, Athletic were knocking at the door once more. Cameron Kerr delivered the ball in from the right to Howie but his first-time shot ended up just wide of Windsor keeper Nathan Cummings’ goal. As the opening period reached the halfway point, Windsor started to make inroads into the opposition penalty area. Robert McCartney burst down the right and set up Justin Jordan, but the No.11 volleyed wide. Windsor continued to give their all but Athletic ended the half on top. After knocking on the door during a relentless ten minutes, they scored. Ethan Wynne was taken out in the box to earn his side a penalty and Gray took charge to rattle the spot-kick in with little fuss. There had been little between the two sides in the opening 35 minutes and that theme continued after the interval. Windsor rallied after some words of encouragement from the bench and they came close to getting on level terms shortly after the restart. McCartney was causing problems for the Athletic back four again and he cut in from the left this time before taking aim from the edge of the box only to see keeper Jamie Smith turn the ball round the post. Windsor continued to plug away but Athletic could well have made it 2-0. Ben Murray squared the ball to Wynne in the box but his shot was hit straight at Cummings. Then, five minutes later, Howie put a hopeful ball into the box and Cameron Kerr took aim from close range but Cummings once more produced a fine save. Windsor introduced Lewis Young and Lewis Higginson to try and make things happen and the latter almost helped his side to an equaliser. Higginson whipped an early free-kick into the box to Jack Main but Smith made a fantastic save to deny the forward in what was their best chance of the game. Late on, both sides pressed desperately in search of a goal but Athletic held on. Athletic Coach Stevie Burgess said: “It was a tough game, Windsor are an ever-improving side and we had to be at our best to get the result on the day. We’re delighted with the result. Leith Athletic A Team 13s: Jamie Smith, Cameron Kerr, Daniel Turner, Cameron Stewart, Euan Howie, Adam Zajac, Ethan Wynne, Lewis Owens, Ben Murray, John Ward, Strathy Mackay, Sam Lewis, Thomas Ramage, Cal Stenhouse, Owen Gray. Musselburgh Windsor 13s: Nathan Cummings, Adam Clark, Jack Dickson, Josh Campbell, Ben Finlay, Lewis Young, Kerr Marr, Ben Gearty, Jack Main, Justin Jordan, Lewis Higginson, Kurt Robertson, Lewis Bowd, Robert McCartney.